Tresa Tatyrek has been interested in family history and genealogy since childhood. She began doing extensive research in 1997, and her research now includes client work as well. She volunteers for the Dallas Public Library which twice awarded her volunteer of the year. She served as President of the Dallas Genealogical Society for three years and as webmaster for six years. She is a member of the Daughters of the American Revolution and many more linage societies. Julie Avedikian is a member of the Mary Shirley McGuire Chapter, Daughters of the American Revolution. With over 22 years of genealogical research experience, she currently serves as the State Chair for the Volunteer Genealogist Committee for the Texas Society DAR and Organizing Regent for the new Blackland Prairie Chapter in Wylie, TX. Julie is also an active senior leader for the Matthew Bolton Society, Children of the American Revolution. Her other organization memberships include United States Daughters of 1812, Colonial Dames of the Seventeenth Century (inactive), General Society of Mayflower Descendants, Collin County Genealogical Society, and Lone Star Parliamentarian Unit. Julie earned an Associate of Science from Collin College in 2018. She lives in Plano with her husband and has two grown sons. You don’t have to be a member of the Society or have ancestors from Collin County or even Texas to take advantage of this FREE program! Don't forget to look at our EVENTS page for upcoming programs! No matter how big or how small, you can host a family reunion. Barbara Hadfield has tips and tricks on how to host without totally stressing out. The City of McKinney and the McKinney Public Library System are not in any manner connected with this meeting, and neither the City of McKinney nor the Library endoreses any position expressed by the groups sponsoring this event. 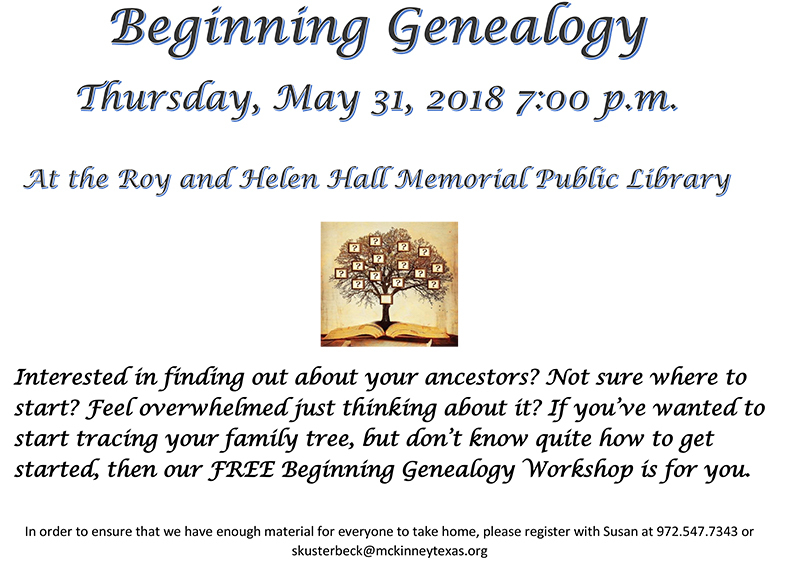 Whether it’s a Brick Wall, you’re new to Genealogy and don’t know how to get started or just interested in meeting others with a similar interest a member of North Collin County Genealogical Society will be here to assist you. 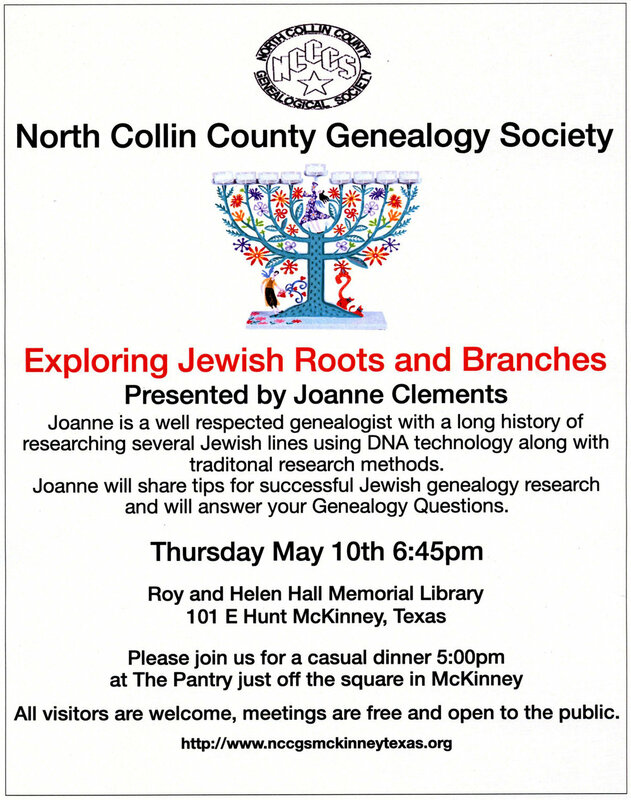 You don’t have to have ancestors from Collin County or even Texas to take advantage of this opportunity! In early America, women were all too often the people who just weren’t there: not in the records, not in the censuses, not on juries, not in the voting booth. The common law relegated women to “protected” – second-class – status and understanding how they were treated under the law provides clues to finding their identities today. 11:00 - 11:50 am – Discovering Your Ancestors Land Holdings in the Texas GLO. Learn how maps can be used in genealogical research. This will be an overview of how to use the archival maps, the GIS mapping system, and the original land grant records to find your ancestors. Learn how to use the Land Grant Database and search strategies to locate the survey in a particular county. Lecture will include a case study using the original GLO maps, GIS mapping system, and county records in determining the location of the heinous 1872 murder of Benjamin McKeever in Burnet County Texas. Budding researchers will learn the basics they need to get started researching their family tree. We’ll cover the first steps to take to begin your research, starting with home sources. We’ll also cover the types of records that are useful for genealogical research and where they can be found. We’ll also cover ways to stay organized by utilizing paper charts and forms or computer software. We all have mounds of old unidentified family photos sitting in boxes. This lecture will offer step-by-step direction in organizing, preserving and cataloging these precious collections for future generations. Learn how to identify, digitize and share collections using family trees and social media. The Dawes Roll, created between 1898-1906 enrolled members of the Five Civilized Tribes living in Indian Territory. Learn why the roll was taken, how the process worked, and the steps to locating an ancestor who enrolled. Examine several case studies that will demonstrate how autosomal DNA testing can be used to solve genealogy brick walls. Examples will focus on AncestryDNA, but may also include other testing companies and services. Perhaps a second or third or even a fourth cousin might have some information about your mutual great or great-grandparents that just might break one of your brick walls. This presentation focuses on finding those living relatives. Shelby will walk you through some internet steps and send you home with website addresses for follow-up research. This presentation focuses on federal census headings and codes, alternate federal censuses, state censuses, and their use in our research. The partnership between the national census website and the use of state censuses in revealing information about our ancestors is demonstrated. The value of a research timeline is also demonstrated. 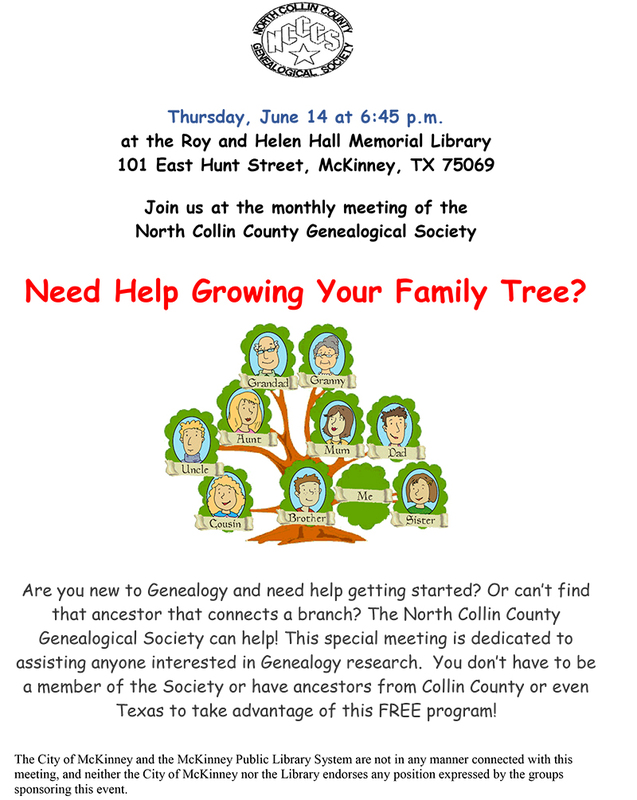 Special meeting dedicated to assisting anyone interested in Genealogy research. If possible please join us for a casual dinner at The Pantry in downtown McKinney. We meet at 5:00pm for a light dinner, visit and then go to the library just 3 blocks away. If you are not able to join us for dinner we hope to see you at the Library at 6:45 for the meeting. "Archaeological Dig at a Family Homeplace"
If possible please join us for a casual dinner at The Celt in downtown McKinney. We meet at 5:00pm for a light dinner, visit and then go to the library just 3 blocks away. If you are not able to join us for dinner we hope to see you at the Library at 6:45 for the meeting. "Using the Portal to Texas History for Genealogical Research"
We are pleased to have Michael L. Strauss as our Spring 2018 Seminar Lecturer. Michael L. Strauss, AG, is a professional Accredited Genealogist and a nationally recognized genealogical speaker. A native of Pennsylvania and a resident of Utah, he has been employed as a Forensic Genealogist for 25 years. The topics for this seminar are Revolutionary War Genealogical Research; Researching Your Mexican War Ancestors; Researching Your Ancestors during the Reconstruction Era, and Genealogical Research in Washington, DC.